By 1950, the European classical influence in American film music was waning, along with the "mickey mousing" technique of tightly synchronizing music to the visuals in a film, as in a cartoon (Max Steiner's King Kong score is a superlative example of this technique). Loud, wall-to-wall music, especially underneath romantic scenes or extended passages of quiet dialogue was becoming much more subtle and less ostentatious. Plus, many filmmakers were responding to the Italian neorealist movement in cinema (exemplified by De Sica's brilliant Bicycle Thief of 1948), whereby real locations were favored over soundstages; storytelling, pacing, and dialogue took on a more naturalistic feel; and subject matter became decidedly darker. Ironically however, sword and sandal epics also flourished, taking full advantage of wide-screen formats and rich Technicolor. The 1950s also saw the slow decline in the Studio System, which had controlled the careers of actors, directors, and film composers through long-term contracts. This change in part resulted in more innovative and daring filmmaking and the introduction of controversial subject matter, such as labor union corruption (Elia Kazan's On the Waterfront), drug addiction (Fred Zinneman's Hatful of Rain), juvenile delinquency (Richard Brook's Blackboard Jungle), and even screenwriting gigolos (Billy Wilder's Sunset Boulevard). In the film music world, Erich Korngold had retired for the most part, the staggeringly prolific Max Steiner began to slow his pace, and Bernard Herrmann was positioned to become Alfred Hitchcock's favored composer throughout the decade. Only Dimitri Tiomkin, Franz Waxman, and the Miklos Rozsa seemed to carry the European classical torch, but they too would approach their scoring with less classical overtones. One of the biggest milestones in film scoring came in 1951, when Alex North became the first composer to use jazz music as underscore rather than just source music in Elia Kazan's A Streetcar Named Desire. This event would open doors for many jazz-influenced composers, like Henry Mancini, Lalo Schifrin, and Nelson Riddle. Enter a 28-year old, New York-born composer, conductor, and concert pianist named Elmer Bernstein with a facility for dramatic film scoring, shaped by years of intensive study and the influence of Bernard Herrmann and Franz Waxman. From the get-go, Bernstein displayed both a keen understanding of cinema and an uncanny ability to create memorable music that significantly enhanced the director's vision and the moviegoer's experience. No other film composer of the time rose from such obscurity in such a short time to take his place among the A List of movie music composers as Elmer did, even in spite of a brief, career-stalling setback. By 1954, EB had begun to break free of the poisonous ranting of McCarthy and his followers, when he was hired to score ballet sequences for stage productions of Peter Pan and Oklahoma. 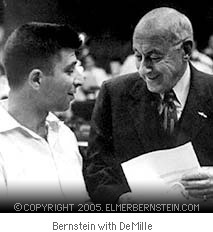 This was a career-defining moment for Elmer, as a short time thereafter, a Hollywood icon of no less stature than Cecil B. DeMille came knocking on the composer's door--and the rest, they say, is history. 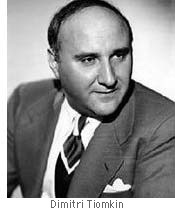 Between 1950 and 1959, Elmer composed scores for 30 films. He'd entered the decade like a lamb, but he left it a lion, with studios and powerful directors competing for his talent to grace their films, and to elevate film music to a highly popular medium that could be enjoyed in films and on its own. Here are my picks for his best scores of the 1950s. The Man with the Golden Arm (1955). American cinema's wakeup call to the depiction of heroin addiction and to the "power" jazz of a bright young film composer exploding in Hollywood. I'd give anything to have been in a theater when EB's searing theme music played over Saul Bass's stark modern art main title sequence. "Clarke Street" begins with that slushy high-hat cymbal flourish, followed by the 5-note low brass riff, which is answered first by solo trumpet, then by the brass section, graced with EB's impressive harmony writing. Immediately, you know this theme is not going to be finger-snapping, cocktail jazz; rather it presages the dark drama that is about to unfold when card dealer Frankie Machine (Frank Sinatra) returns to the city after serving time in jail for being busted in a high-stakes, crooked poker game. It also foreshadows Frankie's battle with heroin addiction--that 40-pound monkey he can't seem to shake. 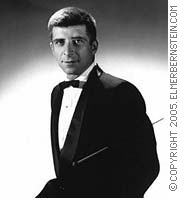 But for film and film music buffs, it introduces us to Elmer Bernstein--not just the composer, but the dramatist--that rare talent that will serve him over the next 50 years through more than 200 films. You know from this score you're experiencing someone who understands the topography of story--the complex motivations of the characters; recurring themes, motifs, or metaphors explored by the screenwriter and director; and the rhythm, pitch, and tempo of a scene, as aided by the film editor. And you know that EB can transfer this knowledge into a musical language that will enhance every aspect of the film. Seen today, this film may seem dated, but we must remember that this was the first film to address addiction to hard narcotics, as Billy Wilder's The Lost Weekend (1945) had first depicted the nightmares of alcoholism. The film's impact falls short of Wilder's film, primarily because it misses two "golden" opportunities to add depth to the drama. 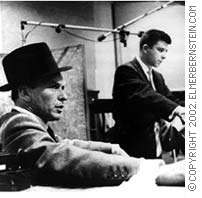 Director Otto Preminger never attempts any trick shots where we actually see Sinatra wailing on the drums, that is, well enough to add more realism to the character. Second, Frankie's other skill--dealing cards--is never explored fully and we only get a single insert shot of the dealer's hands dealing off the bottom of the deck. (Frank Sinatra, Jr. revealed to Turner Classic Movies host, Robert Osborne, that the close-up shot was actually Sinatra friend Milton Berle's hands!) Seeing a dealer deftly handling cards is one of the thrills of movies about card games (A Big Hand for the Little Lady, The Cincinnati Kid). It contains Elmer Bernstein's groundbreaking music score. Whereas Alex North brought us the sultry jazz sounds of New Orleans filtered through the slow madness of Blanche DuBois in A Streetcar Named Desire, Elmer uses jazz-oriented music in this film to create a level of emotional intensity that would become the archetype for urban dramas dealing with drugs, crime, and life on the some of the rough streets of America. It's a huge accomplishment. It's Frank Sinatra's best performance on film (with The Manchurian Candidate a close second). His withdrawal scenes are rivetting and completely believable, but it's his more subtle moments in the film that are pure poetry. Watch his eyes and expression during a scene in the bar where the pusher and the card shark bait him into dealing one more game. His cynicism and complete comprehension of their conspiracy is understated, yet powerful. You can't take your eyes off of him. The Ten Commandments (1956). Grand, elaborate spectacle as only Cecil B. DeMille can create. It's one of the reasons people went to the movies in the 50s--to see something bigger than themselves, be dazzled by spectacular special effects, and to cheer for the ultimate patriarch--Moses. But to project something this big on the screen, DeMille needed a really Big musical score. The director first tested Bernstein's skills by offering him several dance sequences in the film. After being justifiably impressed by the young composer, and after Victor Young had become too ill to take on the project, DeMille offered EB the brass ring, that is, the entire score--although with some trepidation. At one point during early discussions with the composer, he said half-facetiously (and I paraphrase), "don't do anything like you did for the Man With the Golden Arm." The Overture. With the masculinity of a Wagner or Beethoven and the tenderness and beauty of the Miklos Rosza of El Cid, Bernstein creates the quintessential Bible overture, framed by a lovely hymn-based theme for Moses. In this leitmotif, matched by DeMille's imagery and Charlton Heston's theatrical performance, we hear not only the formidable challenger to Pharaoh's reign, but the sorrowful vulnerability of a Biblical character repeatedly plagued by self doubt. Notably, Elmer never resorts to the "heavenly chorus" to characterize the mystery of God's relationship to humankind--so strong is his musical invention. The Exodus. In multiple interviews on film scoring, Elmer has recounted a fascinating story about a scene that originally stumped him creatively--the exodus of the Jews from Egypt. Originally, he composed some slow-tempoed music to accompany an impressively mounted segment where the Jews pack their belongings, load them onto carts or the backs of pack animals, cradle their children, and begin the slow, dusty egress out of the land of the Pharaoh. Apparently, when DeMille heard the piece EB had composed for this segment, he told the composer that the approach was all wrong. The director then suggested--strongly--that Bernstein re-score the piece with exciting, upbeat, and rousing music to give the images more power. After all, these were people who had lived under tyranny and been denied their freedoms to worship and their release needed to be celebratory. 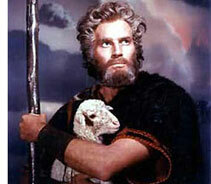 Today, when you watch the exodus scenes that Elmer re-scored, you see how right DeMille was. And this music cue, like so many from the film, is bold and exhilarating, and some of the most majestically powerful music Bernstein ever composed. He would use this approach again to dazzling effect in The Magnificent Seven. Inexplicably, this monumental achievement in film scoring did not even receive a nomination for Best Score by the Academy of Motion Picture Arts and Sciences in 1956. Why it didn't share the limelight with other notable nominees Anastasia (Alfred Newman), The Rainmaker (Alex North), Giant (Dimitri Tiomkin), and Around the World in 80 Days (Victor Young) simply escapes me. 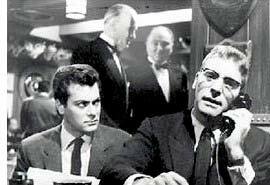 The Sweet Smell of Success (1957). Great score to one of the best films of the late 1950s, in the same league as Marty (also a Hill-Brecht-Lancaster production), 12 Angry Men, and A Touch of Evil. Whereas The Man With the Golden Arm was about addiction to narcotics, The Sweet Smell of Success is about addiction to power, personified by Burt Lancaster's perfectly nuanced portrayal of J.J. Hunsecker, a New York City gossip columnist so influential that public figures respect and fear him and his words in print. Tony Curtis (in his best dramatic role this side of The Defiant Ones) plays a press agent wannabe, Sidney Falco, the ambitious and needy parasite to Hunsecker's Great White Shark. There are two layers of music in the film, which together form a mosaic of powerful, vicious people in a city where nightclubbers drink in the sounds of urban jazz. Elmer Bernstein's music underscores the drama in the film, which involves Hunsecker's plot to frame a young musician (Martin Milner) for being a dope addict to end his romance with Hunsecker's younger sister--apparently the only human being besides himself he cares about. EB's slow walking ostinato, in 5/4 time signature, is the perfect metaphor for the columnist's trampling over anyone in his way or anyone who challenges his kingdom--a favored booth at the famous eatery, Twenty One, where he holds court. The three-note, repeating brass figure creates a kind of tension--a dissonance if you will--that articulates the cruelty and manipulation of Hunsecker and his cronies. The music is as acerbic as some of the film's memorable dialog. Lancaster to Curtis: "You're dead son. Get yourself buried." Or "Sidney, conjugate me a verb. For instance, promise--you promised to break up that romance." Bernstein's score becomes much more somber when we view scenes between Hunsecker and his sister. The composer uses cellos to deliver a mournful, legato version of the main theme. The source music for the film's nightclub sequences is provided by the Chico Hamilton Quintet, which plays the frenetic Bebop at a break-neck speed and features a jazz cellist named Fred Katz, who really cooks. Martin Milner portrays the guitarist with the Quintet, and the man who is framed by Hunsecker and Falco. (Milner's feigned guitar playing is one of the few convincing examples of an actor pretending to play a musical instrument in movies.) This music, as described by EB on the Decca soundtrack LP, is meant to reflect the world of Sidney Falco--the night spots he'd frequent in search of publicity or to create some. A guilty pleasure. I'm sure that I saw this picture three of four times on TV as a kid and really liked it. After all it was about a real pirate, Jean Lafitte, and we even got a little dose of history about the War of 1812, albeit filtered through artistic license. And, it was one of those movies that I learned was scored by Elmer Bernstein, and this only deepened my appreciation. But youthful innocense can be bliss, for after seeing it recently, in wide screen and in full color, it seemed a little stagy and one dimensional, with most scenes filmed in wide shots, with clusters of characters often placed perpendicular to the camera. Much has been written about son-in-law Anthony Quinn reluctantly taking over direction of the film, as dictated by a then ailing Cecil B. DeMille. Which leads us to consider that in abler hands, the film might well have been a classic, as the story is quite compelling and some of the dialog is clever. And, we are ever grateful to have Elmer's music score, which is exceptional. Main Titles. A tour de force of theme composition, this cue begins with an Eb major fanfare colorfully announcing a grand adventure. Then, a stepwise modulation lands in F major, where the string section lays out the sweeping theme for Lafitte (Yul Brynner), the cultured pirate "without a country." Moments later, the brass section delivers Lafitte's powerful 9-note motif, with the flatted fifth, which so perfectly portrays the lawless, adventurous side of the famous French Creole pirate. And what main title sequence would be complete without a love theme? Elmer's B major leit motif for Lafitte and Annette (Inger Stevens) Clairborne's dangerous romance is one of the composer's loveliest melodies. The theme is carried passionately by the strings and woodwinds, again demonstrating the rich articulation of EB's baton. The piece then segues into the rousing Yankee theme for General Andrew Jackson and his ragtag band of militiamen, who with Lafitte's men, will defeat the British at the Battle of New Orleans. Elmer's theme is stirring and patriotic and a perfect accompaniment to Charlton Heston's bigger-than-life portrayal of Old Hickory. The Red Coats and the Battle of New Orleans. This is one of those sequences in films that are forever embedded in your memory because they are so unique or richly dramatized. The sight of the British Red Coats marching through the thick Bayou fog in a perfect formation on the battlefield, to the eerie whine of the bagpipes, is something that definitely stays with you. It's not clear if the music was written for the film or if Elmer supervised the musical sequence, but either way, it's source music at its best. Polka. After the victory on the battlefield, the characters attend a Tara-sized shindig at Governor Claiborne's mansion, where we are treated to EB's most excellent polka, which propels the dancers across the ballroom floor. It conveys the courtliness of Europe, with the exuberance of the great new American frontier. The Buccaneer soundtrack is available on CD (Varese Sarabande and DRG labels), and is outstanding.